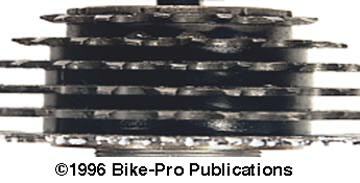 Shimano had largely exited the freewheel market by 1988, though they continued to manufacture them as replacement parts through at least 1992. At the moment, the only freewheel that Shimano makes readily available is the HG20 which is not produced in Japan. The MF-HG20 continues to be made so it can be specified as original equipment by bike makers. Other models of Shimano freewheels have very, very limited availability, but they may be available to us through Shimano distributors with old inventory or through your local bicycle stores. 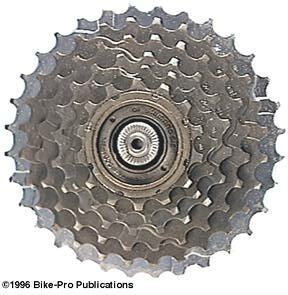 Shimano also makes a high quality 7 speed freewheel, the MF-7400, originally released for threaded Dura-Ace hubs for a freewheel, prior to 8 speed. This, like the previous, uses UniGlide twisted teeth, not HyperGlide teeth, but it is compatible with all past and present Shimano index shifters, (that is, it's SIS compatible). The cogs are cold forged, with a 1.9mm thickness, finished in a dull Platinum-Silver color, with 3.0mm spacing between them, (like HyperGlide), to achieve the 7 speed gearing on a 126mm over lock nut dimension rear axle. Shimano chose to use steel rather than aluminum spacers on this model, adding to it's weight. The four steel spacers collectively weigh 51 grams. The cogs inner notches are in the shape of rounded teeth, and are not interchangeable with HG cogs, which have square notches, (but are interchangeable with the MF-6208 cogs). The freewheel body is made of forged, and lightly machined steel, then colored Black. The bearing cavity is closed off with a threaded Grey plastic seal, that has a rubber O-ring beneath it. Lubricating the F/W body is accomplished by removing the first through fifth position cogs and their spacers with two "chain whips". With these cogs removed, two small holes are revealed that you can inject grease or oil in the internal bearing cavity. The outer cone race comes off by turning it clockwise. It's made of forged steel, and has some of the best grinding and polishing on a bearing race we've yet seen, highly precise work. Under the outer race are thirty-one 3.2mm steel ball bearings, which revolve in a highly polished cup race. Removing the inner body piece show the same high quality bearing surfaces throughout. The inner side cup and cone races are ground and polished to an extremely high degree, which explains why this freewheel holds up so long. The inner bearing are made up of forty 3.2mm steel ball bearings. There are two steel pawls, held in place by a circular, steel wire spring. Both the inner and outer body pieces are made from forged steel, colored Black, (inner), and Grey, (outer), with the machining done afterward. We sell the MF-7400 in 9 sprocket combinations. 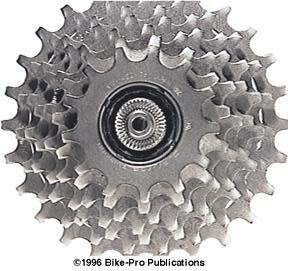 Shimano does make one HyperGlide freewheel, on it's way out of the freewheel market, and it's a 6 speed cluster. This is inexpensively made, in their Singapore plant. The HyperGlide cogs are the standard 1.9mm thick, with 3.85mm spaces between them, intended for a 126mm over lockout dimensioned rear hub. The first through fifth position cogs are made of Brown colored steel, the last, sixth position cog is Chrome plated. The MF-HG20 uses four Black plastic spacers, which have a combined weight of 12 grams. The inner notches on these cogs, is not compatible with any other Shimano made cog. The cogs are held on the freewheel body using a lockring that threads on the exterior of the outer F/W body end. There are no lubrication ports on this freewheel. The outer bearing cone race comes off by turning it clockwise. The race itself is forged of steel, with no noticeable grinding or polishing post-casting. The outer cup race is forged with no noticeable polishing as a part of the outer freewheel body. The are twenty-eight 3.0mm steel ball bearings used for the outer bearing assembly. The inner bearings ride in a cup and race created as a part of the inner and outer body piece's forging. There are thirty-eight 3.0mm inner steel ball bearings used in the inner bearing assembly. The MF-HG20 has two steel pawls held and operated using a circular, wire spring. The MF-HG20 is made in 3 sprocket combinations and we sell them all.